The next day we decided to take a day trip to see some of the nearby sites. We arranged for a driver, Dewa, to pick us up with a minivan, and our family, plus Justine and Steve all piled in and we took off. Driving in Bali is best done with a local driver - the roads are a confusing warren of narrow country roads with few signposts and no streetlighting at night. Dewa turned out to be a great driver, and we took many other trips with him and became good friends during the time we were in Bali. Our first stop was at the village of Mas, near Ubud, which is famous for its woodcarvers. Dewa had not gotten to know us yet and assumed we should be taken on the normal tourist route of overpriced souvenir shops. Still, the carving was quite spectacular. 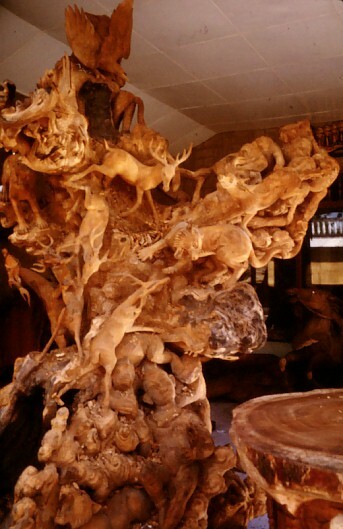 This was a huge sculpture carved out of a tree, with deer and other animals, Balinese spirits, and so on.